Lewis and Clarke opened the eyes and minds of Americans living east of the Appalachian Mountains at the beginning of the 19th century to the great possibilities and riches of the North American continent. Our mountain man presentation is currently a work in progress which is being designed as a visual exploration through the great plains, into the Rockies, and to the Pacific Coast. Using period maps, official reports, personal letters, and paintings, our presentation will trace the original routes of America's early pathfinders. Demonstration of trapper's and skinner's tools of the trade will be paired with display and handling of various animal hides and hunting techniques. A brief history of the unique characters who opened up the west will focus on their special talents for both survival, visual perception, and memory. Students will read maps, trace routes, learn about different geographic features, and be challenged with many questions about how they might survive alone in the wilderness without cell phones, matches, canteens, lip gloss, or hair dryers. 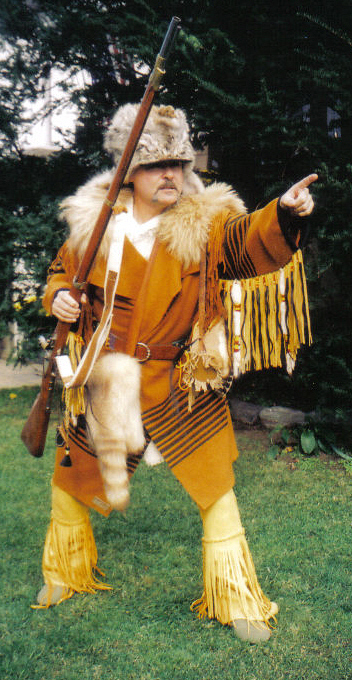 Our mountain man will come dressed in authentic period garb and will demonstrate many tricks for survival in the forest, in the snow covered mountains, in the rivers, and in the desert, all challenges of mountain men of one hundred and fifty year ago. He will teach how to get fresh water, how to build a shelter, build a fire in the rain or snow, how not to freeze to death in a blizzard or after falling into an icy river, how to find water and food in the desert, and many other interesting skills.